Celebrating Perfection in Administration celebrates the establishment of a new political party in India-the Ajeya Bharat Party-which has its sovereignty in the domain of consciousness, its authority in the invincible organizing power of Natural Law, and the ability to nourish all life everywhere. In this beautiful book Maharishi explains that knowledge is the gateway to power for any successful government. -- MUM Press Catalogue, 2001. His Holiness Maharishi Mahesh Yogi is widely regarded as the foremost scientist in the field of consciousness, and is considered to be the greatest teacher in the world today. His Vedic Science and Technology, which unfolds the full potential of Natural Law in human consciousness as the basis of improving all areas of life, is regarded as the most effective programme of human resource development. 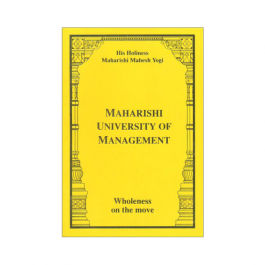 More than 600 scientific research studies conducted during the past forty-four years at over 200 independent universities and research institutes in 28 countries have validated the profound benefits of Maharishi's Transcendental Meditation Programme for the individual and for every area of society, including health, education, business, industry, rehabilitation, defense, agriculture, and government. Over four million people in all parts of the world and from all walks of life practise Maharishi's Transcendental Meditation. Maharishi has trained 40,000 teachers of the Transcendental Meditation Programme so far, and more are continuing to be trained. 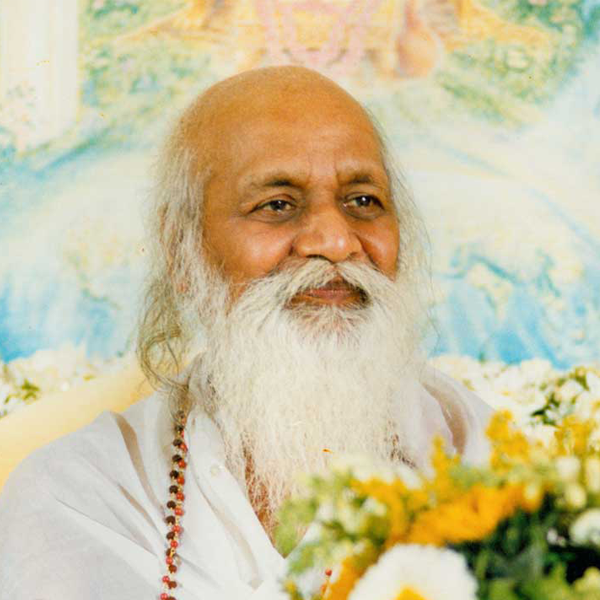 In addition, more than 100,000 people have learnt Maharishi's TM-Sidhi Programme and are daily practising 'Yogic Flying', an advanced programme of Transcendental Meditation that dramatically enhances all the benefits brought about by Transcendental Meditation for the individual, and creates a highly purifying influence in world consciousness. Maharishi has held hundreds of World Peace Assemblies on all continents during the past forty-four years, with many thousands of people coming together to create coherence in world consciousness through the group practise of Transcendental Meditation and the TM-Sidhi Programme. In 1986, on the basis of the rising Maharishi Effect--coherence in world consciousness resulting from his World Peace Assemblies--Maharishi inaugurated his programme to create world peace by establishing a permanent group of 7,000 Vedic Scientists in Maharishi Ved Vigyan Vishwa Vidya Peeth, Maharishi Nagar, India, to create coherence in collective consciousness on a permanent basis through the group practice of the Transcendental Meditation and TM-Sidhi Programme. The practicality of creating the supreme quality of life on earth--Heaven on Earth--through Maharishi's Vedic Science and Technology has been amply verified during the past forty-four years by scientific research, which documents the benefits in every aspect of life--physiology, psychology, sociology, and ecology. It has also been substantially verified by personal experience, and by the authenticity of the ancient, traditional Vedic Literature. Maharishi's knowledge, Maharishi's Vedic Science and Technology, Maharishi's eternal Constitution of the Universe, which is present everywhere, and Maharishi's s simple approach for everyone to enjoy life according to Natural Law are the foundation of Maharishi's global action to create Heaven on Earth and perpetuate it for all generations to come. His inspiration to make every country a 'Country of World Peace', and his invitation to every government to declare their country the 'Country of World Peace', lead to the inauguration, on 7 October 2000, of 'Maharishi Global Country of World Peace'. Maharishi in the world today is a cosmic figure caring for the well-being of all mankind and establishing a system to perpetuate life according to Natural Law, the cherished ideal of every government. One wonders whether there could be a greater ruling intelligence than the one that is available in the world today in the form of Maharishi who is making life on earth heavenly, and who is making Heaven on Earth a reality. Maharishi attributes his achievements to Shri Guru Dev, His Divinity Swami Brahmananda Saraswati Maharaj, Jagatguru Bhagavan Shankaracharya of Jyotir Math, Badrikashram most illustrious embodiment of Vedic Wisdom in the eternal tradition of Vedic Masters. During the past forty-four years the purity of world consciousness has been steadily rising; the light of pure knowledge has been steadily rising; life according to Natural Law has been steadily rising. It is satisfying that with the blossoming of Maharishi's Absolute Theory of Government, the world is witnessing the signs of a new awakening in every field in the direction of fulfilment. Now is the time for the world to witness the full glory of life according to Natural Law--to experience the full dignity of life in peace, prosperity, and happiness, with enlightenment and fulfilment in daily life. 'The goal is to establish a Vedic Capital of Global Administration through Natural Law, with the knowledge of Veda, total Natural Law, as the Constitution for two-hundred thousand Vedic Pandits to live their Vedic way of life and perform large Yagyas, Graha Shanti, and Samskaras, to create and maintain a strong, indomitable influence of coherence in world consciousness, so that peace and harmony prevail and the whole human race lives in perpetual peace in a problem-free world--perpetual peace on earth.' -- Maharishi. 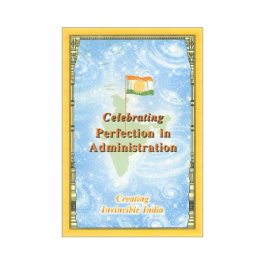 Celebrating Perfection in Administration provides a practical handbook for how to align human administration with the perfection of Nature's administration. Think about it. (Maharishi inspires you think about things in ways you've never thought about them before.) Do the planets collide in space? What maintains them in their perfect orbits? What governs the cycles of day and night so reliably? Every day we take for granted the perfect orderliness of Nature's functioning. Throughout the book, Maharishi demonstrates how each area of government administration, education, health, etc. can be made vastly more successful by aligning the awareness of the administrators (and the people they are administrating) with Nature's own unlimited intelligence. He presents the example of the Indian Government today. India is not utilizing this key secret of Nature's functioning, even though this knowledge is available in India's own Vedic heritage. Maharishi's insights have sliced through centuries of the loss of Vedic Knowledge - - the oldest and most complete tradition of knowledge in the world, and brought this timeless wisdom of totality of life into the present, where it is sorely needed. He provides a practical formula here to make the administration of modern India perfect, a formula so universal that it could easily be applied to every other nation. Even if, like me, you're not directly involved in government administration, the book is still fascinating and relevant. Maharishi defines administration much more broadly than most of us would. After reading Celebrating Perfection in Administration, I realized that each of us, whatever our walk of life, is involved in administration every day. We administer every aspect of our own lives, and how perfectly we do this determines how successful and efficient we are in fulfilling our desires. Seeing Maharishi's vision of how perfect every kind of administration can be, I felt deeply motivated to apply this wisdom to administer my own life more and more perfectly--and I felt deeply grateful that someone living on earth today is bringing out knowledge that can restore perfection to human life. When I picked up the book Celebrating Perfection in Administration, I was expecting to find a few points on how to administer in a more perfect way, something that in my role as an administrator I was eager to know. When I opened the cover and saw the subtitle, "Politics is a pious profession," I was curious, this sounded like an oxymoron, yet I was intrigued. By the time I finished the book, my awareness had been expanded from the trivia of day-to-day administration to the perfect administration that takes place in our cosmos at every second through automation in administration through Natural Law. I was inspired to have a glimpse of what national administration could be, to see the beautiful results that a government could provide for its people. Not only did I now see that there is the possibility to simplify everything and have ideal administration of every area of life, but I realized that I could easily adopt and implement these principles myself. How? The key concept seemed to be consciousness, collective consciousness and individual consciousness. By handling that, everything else could be managed. How to do it? The Transcendental Meditation technique (TM) was the key. The knowledge in the book was empowering, but the knowledge I gained of myself by learning TM was a whole other level of power. I could see that if everyone had access to this, that all administration could be perfect, and, yes, politics could really be a pious profession! Whether one administers a nation, a state, a city, or a few people, the knowledge in this book is essential, and the secret to living the knowledge is practicing Transcendental Meditation. Maharishi explains that knowledge is the gateway to power and that everyone will find fulfillment in the supreme knowledge of administration contained in these pages. He introduces the principle that because everything is Vedic, everything should be what it is. Topics also include Vedic Agriculture, Vedic Industry, and the formula for creating a national budget to create national integrity and invincibility. Softcover, 418 pages. Published in 1998. Not stocked, available for back order.